Critical hits were something I never really understood coming into MWO during Closed Beta. You honestly have more critical things to worry about when adapting to this game. Sorry for the pun. The time I realized I should look into the subject it was open beta, and the only hard information had been wiped away. Hearsay was tempting but often disagreed with itself. It wasn’t until the data was re-released that I started actively looking into how crits impacted my gaming experience. I’d say the main reason crits are so elusive to the public is that they aren’t always obvious. You shoot out an AC/20 and only someone who was watching their opponent’s weapon loadout will know that they just critically destroyed a weapon. It may be easy to miss crits, but that doesn’t mean you shouldn’t seek them out. They can be incredibly powerful, and can change the way you build mechs. I find it’s best to learn this from the developers Bryan Ekman, Creative Director, and David Bradley, Game Designer. NOTE: Some of the changes mentioned are already in game, as this was posted in early December. The gauss rifle change, for example, is already in the game. I’ve updated the rest of the guide, but am keeping these source quotes unaltered. Just a heads up! Each time the internal structure of a Mech takes damage, there is a chance that the hit will cause at least 1 critical hit. There is a 25% chance of causing 1 critical hit, a 14% chance of causing 2 critical hits, and a 3% chance of causing 3 critical hits (for a total of a 42% chance of any sort of critical hit). Each critical hit will randomly hit a weapon or piece of equipment in that location; the chance of a particular piece of equipment being hit is proportional to how many critical slots it occupies. Each critical hit damages the weapon/equipment an amount equal to the damage that caused the critical hit. For example, an Atlas AS7-D is hit with an AC/5, for 5 damage to its left torso’s internal structure. The attacker gets lucky and this results in 3 critical hits. Two of the crits hit the LRM 20 and 1 hits the heat sink. The heat sink will take 5 damage and the LRM 20 will take 10 (5 x 2 = 10). Currently, all engines have 15 points of health while all other items have 10. One of the changes going through QA right now, and that will be applied to an upcoming patch, is lowering the health of the Gauss rifle to 3 points. And, sometime soon, we plan on doing a full pass on the health of all the items. Critical damage to the side torso hit boxes of XL engines deals damage to the engine as a whole. However, it should be noted that, currently, critical damage to your engine will not disable it, but simply add to your repair bill. This is likely to change when we do the pass on the health values. Weapons that deal damage over time, like lasers, work by quickly dealing tiny amounts of damage repeatedly over the lifetime of the laser beam. I think the medium laser does something like 0.20 – 0.25 damage repeatedly until it does the full 5 damage. Each of those micro damage hits have their own chance to crit. This means that lasers will have many chances to crit, but the crits will be spread out amongst the equipment in the location, and do little damage each time. Meanwhile an autocannon will have only one chance to crit per shot, but do all its damage to one piece of equipment (or applied multiple times if you get a double or triple crit). For those that hate reading, I’ve devised a flowchart to summarize the general process of how crits happen. This latest patch (2-19-13) has introduced some variable crit rates and item HP. Please refer to the offense section if you would like to target a specific weapon. – The Flamer has a 14% increased chance to crit once, an 8% increased chance to crit twice, and a 3% increased chance to crit 3 times. – When the Flamer crits, it will deal 1.1x the amount of normal damage to an internal item. – Flamer crit damage is 0.4 x 1.1 = 0.44 per crit. Max crit of 3 times = 1.32. – The low damage mulitplier is due to the fact that the Flamer already has it’s head increase ability. – The LB10-X has a 14% increased chance to crit once, an 8% increased chance to crit twice, and a 3% increased chance to crit 3 times. – When the LB10-X crits, it will deal 2.0x the amount of normal damage from 1 ‘pellet’ to an internal item. – The LB10-X crit damage is 1.0 x 2.0 = 2.0 per crit. Max crit of 3 times = 6.0. – The Machine Gun has a 14% increased chance to crit once, an 8% increased chance to crit twice, and a 3% increased chance to crit 3 times. – When the Machine Gun crits, it will deal 12.5x the amount of normal damage per bullet to an internal item. – The Machine Gun crit damage is 12.5 x 0.04 = 0.5 per crit. Max crit of 3 times = 1.5. – Due to the rate of fire, the Machine Gun is now a heavy crit seeker and will be VERY effective vs. items on non-armoured locations. First, Gauss ammo does not explode, but the Gauss rifle does (for 20 points of damage). However, it was discovered that the Gauss rifle explosion was not working properly. The fix has been completed and will be implemented in an upcoming patch. When ammo (or a Gauss rifle) explodes, it can cause large amounts of damage. If the explosion destroys the internal structure of a location, any remaining damage is transferred inward, to the internal structure of the next location. Arms and legs transfer to the appropriate side torso, side torsos transfer to the center torso. CASE prevents the explosion from transferring past the location in which it is installed. For example, if you have CASE installed in your left torso, any explosion that starts in, or transfers into, your left torso will never transfer any damage into your center torso. Some of you may notice that this doesn’t do anything for Mechs with XL engines, and yet many of the canon default loadouts include XL engines and CASE in the side torsos. We are currently considering some additional tweaks that would ensure that this is not a completely useless combination. These bits of information have informed the rest of my guide. If you feel like backing out now, feel free. You’ve already read the best of what you’re here to find anyways. I’ve gotten a few requests to clarify my terminology, and I’d like to keep them consistent and understandable. I will be sweeping through the thread and correcting/clarifying things as well, but this section should help head off initial confusion. “Crits” – This word may be used interchangeably between Critical Hits and Critical Slots. The Critical Hit is determined by the first roll of the critical system. It is a flat rate of 25% for a 1x crit, 14% for a 2x crit, and 3% for a x3 crit. The Critical Slot is the amount of slots an item takes up within a mech component. This number, compared proportionally against the other items in the same component, determine the chance of a successful critical strike landing on the item. Incapacitated – When a mech is incapacitated it is no longer able to be played. You lose control of the mech until it is repaired, and are put into spectator mode. In a match, it is easy to describe this as being “destroyed” or “dead”. Destroyed – While this can refer to the status of a mech as stated above, I also use it to describe the status of a component or even items/equipment when it is struck by a critical hit of sufficient damage. The target of the destruction should be referenced when it’s used to help keep this clear. Component – A mech is made up of eight (8) components. These are Head, Center Torso, Left and Right Torso, Left and Right Arm, and Left and Right leg. These are what you see on your paper doll (the little mech readouts that show damage on your screen). If you lose one of these, you lose whatever is stored inside it as well (be it weapons, ammo, engines, etc.). Special notes: If a side torso is destroyed, its corresponding arm (if it’s still attached) will also be lost. If both legs are destroyed, the mech will be incapacitated. If the head component is destroyed, the mech will be incapacitated. Equipment or Item – These are weapons, engines, electronics, heatsinks, ammo, etc. that are stored within components. When a component is critically struck, the equipment/items are what take the hits. 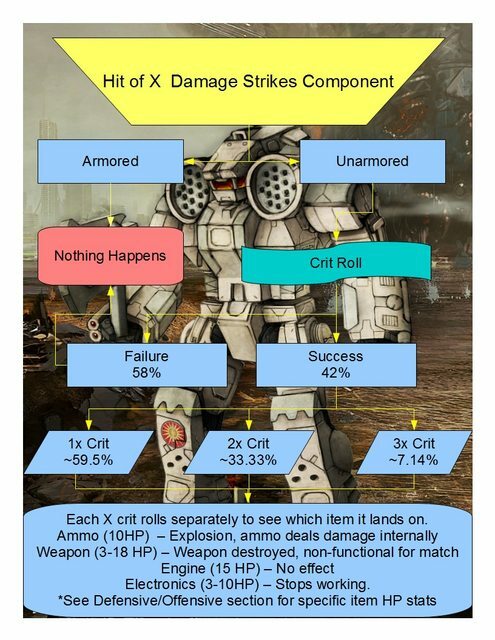 To clarify: the critical hit system applies damage to items that a player has inserted in their mech components, but does not apply additional damage to the component itself (exceptions: Gauss explosions and Ammo explosions both apply damage to the component, yet the crits that caused them are not factored into the total damage dealt). Engine – Now that the above terms are described, we can discuss the current implementation of the engine. If the component your engine is stored in is destroyed, you will be incapacitated. If the engine itself is struck by crits (the item) and destroyed, nothing happens to your mech. Currently, the critical hit system cannot incapacitate a player by destroying their engine. You must destroy the component that has the engine within it! Critical hits are going to happen. You can’t prevent them from happening once your internal armor is exposed. You can, however, change the percentage they have of striking items you don’t want to lose. I call this item or crit buffering, since it involves filling a space with mostly neutral or beneficial items that take up critical slots. The proper defense against crits involves identifying what is dangerous or important to you, like ammo or an AC, and stuffing its component with other things that will help take hits for it. The percentage of an item being hit is based off the number of critical slots an item occupies compared to the other items within that same component. This means items that take up more critical slots, like the AC/20’s whopping 10 crits, are more difficult to buffer. Buffering is a game of proportions, which means adding too much results in less benefit. It also makes it riskier to lose the component you’ve buffered, as it’s now full of often beneficial items you’ve used to take up space. Buffering is often used to protect weapons. Your opponent either knows, or can deduce, the exact location of where you have placed weapons, and may attempt to destroy them. This makes buffering (and damage mitigation techniques like twisting) your best recourse for dealing with these attacks. e.g. A double heatsink occupies three critical slots. If you placed one in a component with a medium laser that occupies one slot, you would have a higher chance of a successful crit striking the DHS (75%, or 3/4 used critical slots occupied), and a lesser chance of the crit striking the Mlas (25%, or 1/4 used critical slots occupied). This concept of ammo storage, generally exercised by LRM “boats” or mechs heavily dependent on ballistics, is to use the principles from the ALS (Ammo Location System) to keep ammo stored within a mech in rather commonly struck hardpoints. The key to this system is knowing how much ammo is in a ton, where it is stored in your mech, and in what order your mech will be using its ammo stores. This gives you a clear picture of what components are vulnerable to an ammo explosion at any given time. It also means you can use previously ammo filled components to absorb incoming damage, since empty ammo doesn’t explode. If you’re going to be using an ammo dependent mech, you should read the guide on ALS. If you ever forget where ammo is stored in your mech, you can check the readout in your cockpit–yes, that little flashing mech panel accurately tells you where your ammo is stored and in what amount. The order ammo is used in is as follows: Head->Center Torso->Right Torso->Left Torso->Left Arm->Right Arm->Left Leg->Right Leg. This method is widely used in mechs that use Ballistic or Missile weapons but don’t carry much ammo. The goal is to “hide” vulnerable items like some sort of apocalyptic chipmunk and just hope for a short nuclear winter. Small critical items like Ammo invariably end up hidden in the legs, CT, or head because they aren’t often/easily targeted, and if you lose them the game is most likely over for you anyways. Just keep in mind some people actively search for players who stuff ammo in their socks, and if they see an unarmored leg they’ll pot shot it with crit-seeking weapons just to see what you might have. An ammo explosion in a leg can be pretty nasty due to how damage transfer works. Fair warning. Heatsinks are the most common buffering equipment. This is simply because you usually need them to function, and you need to stick them somewhere. Single Heat Sinks take up one critical slot and cost one ton. Double Heat sinks take up 3 critical slots and cost one ton. Both have 10 HP. DHS make better buffers, but they hurt your heat efficiency more when you lose them. They are also harder to fit, and cannot be placed in the legs, head, or CT (but can fit in engine slots). Gauss ammo is comprised of metal slugs. They can not explode if critically struck, and are effectively inert tonnage. That’s perfect for critical buffering. Gauss have 7 critical slots and are easily struck. It makes sense to store your Gauss ammo in the same component as your Rifle to reduce those odds of it being critted. This won’t reduce the odds of the GR from exploding. That is a 90% chance when the Rifle is critically destroyed. Do note that if the ammo is struck and critically destroyed, you’ll lose that particular stack of ammo. A fair trade, if you ask me. This item does NOT prevent critical hits, it prevents damage transfer from ammo explosions. If your ammo is struck and begins to cook off, C.A.S.E will prevent the damage from moving past the component your C.A.S.E is stored in, but you will still lose that component. The devs are currently looking at ways of increasing the viability of C.A.S.E, so this may change in the future. I highly doubt, but do not know, whether or not C.A.S.E. even counts as an item for critical hit rolls. I would not recommend using it as a buffering agent. XL engines take up critical slots in your side torsos, but they still count as an engine. Currently, critically destroying an engine has no ill effect. This creates a shared 15 HP buffer in Side and Center Torsos for XL, and just in the center torso for STD engine users. The Center Torso is also very high up on the ALS feed, so if you’re going to be using a lot of ammo it’s a decent place to store it. Just don’t take a lot of CT damage before using your ammo! I’m not sure if these are “in the game” as of yet, but they will form natural crit buffers once/if they are. I believe it’s intended that they become crittable, so if you destroy an actuator in an arm you could limit the amount of arm movement of the player. However, consider these items uncrittable until further notice/official response. These are upgrades that occupy critical slots, but cannot be targeted by critical hits and do not factor into critical slot calculations. They cannot be critically destroyed. If every component containing an upgrade is destroyed: nothing happens! Before you start stuffing every component you have with heat sinks, you need to consider how valuable the item is that you’re buffering. If it’s at the point where others will actively seek it out, placing the majority of your heat sinks in that component may not be such a good idea. You’re essentially trying to reduce the chances that you lose an important weapon before you lose the component it’s stored in. Even a small amount of buffer can reduce the critical chance on items by 20-40%. Against most weapons in the game, that’s enough protection that you’ll ever need. It’s a game of proportions, so you don’t need to go extremely overboard on stuffing components. Choosing a weapon with high critical slots makes it easier for crits to strike that weapon, and it becomes harder to buffer it because of limited critical space. If you’re having trouble fitting a build around a high critical, high tonnage weapon. A downgrade could also result in an upgrade in crit protection. I wouldn’t recommend going ‘out of your way’ to prevent crits in this way. Don’t just downgrade your AC/20 because you’re afraid its going to be critted. Critical hits happen! Fit your mech for the best damage/range of your build, and then find ways to deal with the vulnerability after. Playstyle is often a great substitute for having ‘risky’ weapons like an AC/20. If you don’t reach internal armor, you cannot be critted, so good damage mitigation is key. Those risky weapons often have better damage, or more range. You can keep yourself from being in bad situations just through virtue of playing smart. What I’m trying to say is that fitting against critical hits isn’t everything, but there are times you should pay attention to it–especially when storing ammo or placing heatsinks. If you read the above closely and want to critically hurt someone, there are a number of weapons you should think about, and others you probably shouldn’t. Given the new changes to Machine Guns, Flamers, and LB10-X’s there may be updates to this section so that efficient crit-seekers can be found. Look for it after this discussion. With the most recent patch the AC/20 has become a fairly healthy weapon. Given its massive critical size and unwillingness to be buffered this is a good thing. The only weapon that can critically destroy the AC/20 in one basic crit is the AC/20 itself. Effect? Nothing. It does absolutely nothing, yet. A critically destroyed engine does NOT destroy you in game. The only way to ‘kill’ an opponent through their engine is to destroy the component it is housed in. For STD engines this is the Center Torso. For XL engines this is the left, center, and right torsos. Hopefully this clears confusion: Critically destroying an engine does not kill you in game. Weapons: The Gauss, and also the AC/20, are the most efficient at critting this item, but until it has an effect it’s a wasted notion. Effect? Ammo can explode, and that seriously hurts. Destroying heatsinks reduces heat efficiency. Destroying weapons puts them out of commission. . Weapons: 10 Damage burst weapons are the most efficient here. Stick with me, but the AC/10 and PPC are quite arguably the greatest weapons for seeking critical hits. The AC/10 has the fastest refire (2.5s), so it gets the most tries at one shotting items in a component. The PPC has more range, is ammoless, and come some future patch should have an incredibly fast travel speed. The Gauss and AC/20 are also very solid at critting components, but fire slower with more overall damage. Electronics: Both the Command Console and Beagle Active Probe (BAP) have 10 HP, and can be critically destroyed. Unknown: How does CASE work if its rolled on for a crit? Effect? 90% chance of guass rifle explosion when critted. Deals 20 internal damage to the component. ECM ceases to function. Weapons: I wouldn’t recommend picking weapons to seek out crits on the Gauss. The smaller calibre of weapon needed means almost all weapons have a serious chance at messing up a Gauss sniper’s day. BIG NOTE: As of last patch (the 5th) there are several errors in the raw files that may be impacting critical hits for these weapons. Kmieciu was kind enough, and clever enough, to point them out. I will remove this when they receive their fixes (presumably next patch). -The MG currently has a .8 increased chance to x2 crit instead of a .08. This is a massive buff to the weapon and it will perform over twice as well than expected. -The LB10x’s crit increase parameter is misspelled, so it is possible that the weapon has not had its crit buff yet. The Crit Multpliers are shown here, with refire time of the weapons in parentheses. Since Machine Guns are often used en masse I’ve formulated their TTK on target components depending on how many MG’s are being used. The HP System and effective weapons above are chosen soley for their ability to critically penetrate. With the change to MG’s, Flamers, and LB10-X’s there’s really a new stat discussion that is defined by efficiency. These are typically low damaging weapons that have modified crit multipliers and chances. Critically speaking these weapons can pack a wallop, but they are poor at dealing damage. You have to specifically want, and fit, to cause crits with these weapons. Penetration relies solely on the most basic level of damage to destroy the item you are attacking in one crit. If you don’t get lucky on crits this way you have a higher chance of destroying the component itself before any items within it. Efficiency in critting deals less damage overall, but your chances of critically destroying everything in that component are increased. This can be important if you are crit-seeking ammunition. If you strip a leg of armor and destroy it in three shots with an AC/10 (three rolls of at least 42% to crit), you have a chance of not critically destroying anything. If you shoot the same exposed leg with machine guns you can stay there until the ammo is critically destroyed. In the majority of cases, however, few will argue against just destroying the component. Destroying a component destroys everything within it. I’ve compiled the Avg. DPS of all weapons in the game (sans lasers). Keep in mind that weapons that deal more damage than your target item HP may have higher AVG. crit damage, but only some of that crit damage is actually being applied to the target item. So an AC/20 may have a higher crit damage than an AC/10, but for attacking a 10 HP item the AC/10 fires faster and is a better choice. Overall, avg. crit DPS is more accurate at describing a sustained fire weapon’s chances of destroying items, and less accurate at determining the efficiency of a burst weapon. The LB10X is a hybrid of the two, and I’m still working on the statistics needed to determine its burst efficiency. Once I have that, I’ll release the OHKO rubric to determine the effectiveness of burst weapons. I’m pretty sure there will be mistakes, or poor assumptions in my guide. Many things are subject to change, or simply unknown as well. I’d welcome any constructive criticism, even if it’s just that you don’t like my formatting/writing style. I sincerely hope this guide is helpful, and if it isn’t, I’ll just have to make it helpful. Thanks for reading!